If you read my blog frequently, or are just glancing it over for the first time, it’s pretty obvious that I love traveling to the South Pacific. 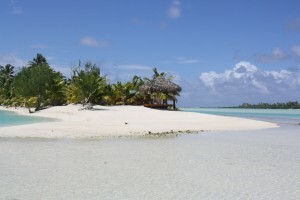 I have had the desire to visit the Cook Islands for some time now, not only because it’s a tropical paradise in my favorite part of the world, but also because it has always been billed as a more budget friendly alternative to Tahiti. I often get travel requests for Tahiti with a proposed budget in the $5000-$6000 range and, most of the time, it’s just not doable. However, would the Cooks be doable? And, if so, is it a worthy comparison? The answer is YES! To get the facts out up front, as a travel agent, I often have access to familiarization trips at a substantial discount, or receive reduced rates. I want to pass along that this was NOT the case for this trip. So, when I speak of budget concerns with Tahiti versus the Cooks, I’m talking in real terms of knowing EXACTLY what it costs, as a normal traveler who wanted to go on a really cool vacation. After having traveled to both destinations as a normal traveler, I can now say that for the same cost (let’s say $6,000) you can get 5 nights in Moorea in a standard garden room (aka standard room- no bungalow!) 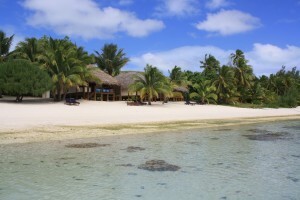 with ferry transfers, or you can get a beachfront villa in Aitutaki with interisland airfare. So, now that the disclaimer is out of the way, let’s get into the good stuff! 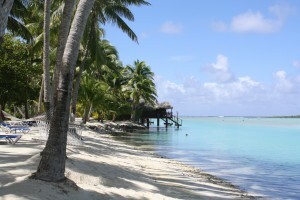 Air New Zealand operates a once per week direct flight from LAX to Rarotonga. 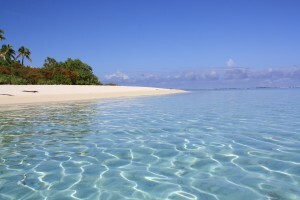 So, with that option, you can either be in the Cook Islands for 5 nights or 12 nights (or possibly beyond, of course!). We did the 5 night option. 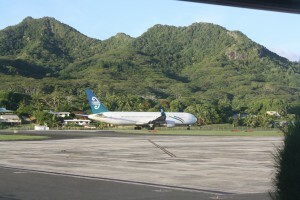 The flight departs around 11pm on Sunday evening, arriving into Rarotonga the next morning at 6am local time. It returns just prior to midnight on Saturday evening and arrives back into LAX at noon on Sunday. Keep in mind these times are based on DST. The flights are generally priced around $950/person, but costs increase based on seasonality and how sold out the flight is when you go to book. The cost of the flight is usually much lower than a direct flight to Tahiti, mostly because of the favorable exchange rate with the New Zealand Dollar versus the bad exchange rate with the Euro/South Pacific Franc. Air New Zealand often runs specials as well, so be on the lookout. The flight to Rarotonga is approximately 9-9.5 hours on an outdated 767. I paid $400/person at the airport to upgrade to business class, thinking it would be nice to lay down and get a good night’s sleep on the red eye flight. The business class seats are old and don’t fully recline, so I wouldn’t really deem it worth the money, except for the service of the lovely and helpful staff. At least until they get their new Boeing Dreamliner running the route! Expect that in the October timeframe. There were only ourselves and three others in business class on the way down, but it was full on the way back. The flight was almost full on the way back, actually. Upon arrival into Aitutaki, we were greeted by Shardae, one of the staff members at Etu Moana. She shuttled us to the hotel, which is approximately a 5 minute drive from the airport. At the hotel, we were greeted by the managers, Steve and Amanda, who are Canadian, but have been operating the resort for a couple of years now. They handed us fresh coconuts for a refreshing drink and gave us a very warm welcome. As you walk around the resort and spend time there, you can tell how much Steve and Amanda care about the property and the guests. They really went above and beyond for us during our stay, and for that, we are extremely grateful. After Shardae gave us a quick tour of the property and the details of how to find your way around, we settled into our villa- Villa 2 aka beachfront villa. I had booked a bit late and had aimed for the absolute beachfront (Villas 1, 3, 9 and 10 are all absolute), but they sell out well in advance and, in all honesty, Villa 2 was perfect! It’s just across from the pool and honesty bar and a mere 30 steps away from the beach. The absolute beachfront villas had an incredible view and are certainly a nice way to splurge, but at times, we felt they were not quite as private. If I had to choose the best absolute beachfront, I’d say Villa 10. If I had to choose the best beachfront, I’d say Villa 2. Villa 4, the only other beachfront, is a bit closer to the beach (20 steps), but is right next to the pool bar and the BBQs. 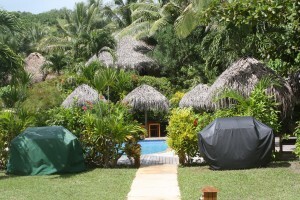 There are also 4 other villas, each with an oceanview, but located closer to the reception area. They are a great way to enjoy the property, which is AMAZING, but on a tighter budget. 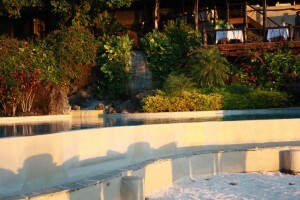 With only 10 villas, it’s pretty obvious that Etu Moana is a small property. It’s certainly everything you’d expect from a boutique hotel- small, high quality, and a focus on the experience and service rather than opulence. The villas are all the same size and layout and extremely well constructed. The furnishings are tasteful and of high quality as well. The interiors, as well as the exteriors, have an authentic vibe, yet are modern and simple. Each villa has a porch with a day bed, lounge chair, and dining table. Inside, there is a king bed, TV (that gets all of two channels, but you don’t miss it! ), day bed that can be used for a third guest, bathroom with large shower, outdoor shower area, and a large kitchenette. The kitchenette has a cook top, fridge, sink, and any type of kitchen gadget you can imagine. I really got great use out of the kitchenette, as well as the BBQs located adjacent to the pool. Nothing beats a nice romantic meal on your porch while watching the sunset in paradise! The rest of the property is just stunning. Everything was immaculate at all times and cared for very well by the staff. The pool never had even a leaf floating in it! The villas and pool are surrounding by lush tropical foliage of all kinds and it makes the property very intimate and warm, not to mention private. The beach is quite large, and while the sand is mostly made of broken down coral (characteristic of most South Pacific beaches), there are stretches of extremely soft, white sand. The staff rakes the beach each morning as well to ensure that any debris or large pieces of broken coral are out of the way of guests. The pool bar, even though not staffed, was always very clean and well stocked. It is an honesty bar, so the guests have full access, but must keep account of their usage. The pricing is extremely reasonable and the system works very well. Everyone there respected the system and also cleaned up any messes made while mixing cocktails. The rates at Etu Moana not only include the wonderful villas, but breakfast, kayaks, snorkeling gear, DVD “rental”, and access to bicycles are also a part of the package. Take advantage of it! The breakfast is a simple continental spread with breads, fresh fruit, cereal, and yogurt. Tea and coffee are also included with the breakfast. Breakfast is served around the pool, but if the available tables are full, the staff will set you up to eat on your villa porch. There are several sets of snorkel gear available at the pool. The snorkels and masks are kept in cleaning solution and the fins are in a storage bin next to the masks. The kayaks are sitting on the beach, ready for use, in front of Villa 1. The bicycles and DVDs are available at the reception area. There are ten mountain bikes that can just be taken at any time and are located just behind the reception building. The DVDs are just next to the reception desk. There is actually quite a large selection. Just be sure to sign out the DVD when you borrow it. The DVDs came in handy on a few evenings that were cut short by rain showers. As this vacation for us was primarily about relaxation, we spent a generous amount of time on the beach. 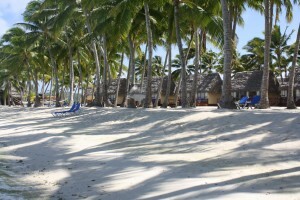 Etu Moana has several sets of lounge chairs along the beach available for guest use. 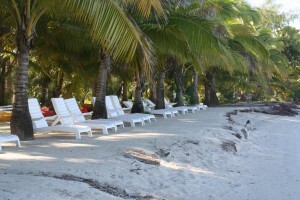 Very often, the chairs were unused and we were the only ones enjoying the sun and sand. As the lagoon in front of Etu Moana has a decent amount of coral, we also rode our bikes to Samade on the Beach, which is a small property facing the inner lagoon. The beach is mostly shaded, the lagoon mostly coral free, and for $5NZD/person or a couple of drinks, you can use Samade’s chairs for the day. The view from Samade, if nothing else, is worth the bike ride. Among the other activities we decided to try out, we rode our bikes into town, which is on the opposite side of the atoll from Samade. 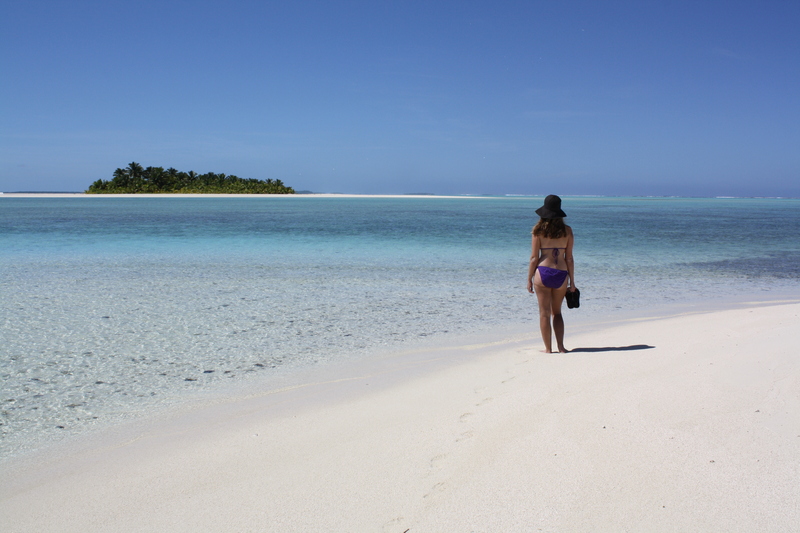 It was interesting to look around and it’s very hard to get lost on Aitutaki. During another bike outing, we also took in a local rugby match, which was quite lively, as almost the entire island was there! We did a fair amount of snorkeling off of the beach at Etu Moana as well as on Miana Island. We booked a water taxi through Wet n’ Wild (Quentin) and for $40/person you get driven out one of the outer motus (primarily One Foot, Honeymoon, and Miana) to spend as much time as you want on the island to explore. Quentin also stopped at a prime snorkeling location used for many of the lagoon tours. I highly recommend booking a lagoon tour after having stopped there to snorkel. A lot of locals kept asking if we had done our lagoon tour yet and after that brief preview, I can see why they are so passionate about it! We also did Island Night at Tamanu, which is a very short 5 minute walk on the beach from Etu Moana. Tamanu has a beach bar that is open daily, but on Thursday nights, they feature local cuisine and a dance show. I’ve seen my fair share of Polynesian dance shows over the years, but this one is worth it. The fire dancers are very skilled and it’s quite amazing to watch. Last, but certainly not least, we also booked in-room massages. Etu Moana works with Susanna, a local massage therapist. She set up her table on our porch and the pricing was very reasonable ($110 NZD/person for an hour.) You can choose either a traditional massage or deep tissue. I believe she also offers facials. Now on to the food! As mentioned previously, Etu Moana has full kitchenettes in their villas, as well as BBQs near the pool. They also provide access to an oven and microwave in the pool bar. So, upon arrival, Steve drove us to the local grocery store to pick up some essentials. We chose pasta, cheese, sauce, and some snacks. We were able to make quite a few meals out of the pasta we purchased. We also purchased a BBQ pack from Koru Cafe. Koru Cafe is a small restaurant located near Samade. It is owned by a couple from New Zealand and they have some of the best food on the island! They offer regular dining, as well as picnic packs, and the BBQ packs. On their BBQ pack menu, you can choose from chicken (marinated or not), steaks, or fish, along with sides and dessert. The portions are quite large and we had plenty of chicken left over after our first meal. Outside of cooking our own meals, we also had lunch at Koru twice. They serve breakfast all day, so if the continental breakfast at Etu Moana is not enough, you can stuff yourself full of pancakes or french toast at Koru! We also had a romantic dinner at Rapae, which is located at the Pacific Resort (more on the Pacific below.) It’s billed as the nicest, fanciest resort on the island and while the food was good, it is a bit pricey. However, it might be worth the cost to snag a table there at sunset, as Rapae is built on a cliff looking out over the beach and lagoon, directly facing West. 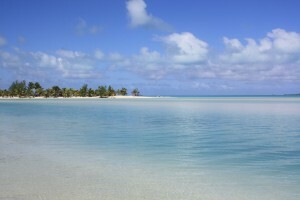 Aitutaki Lagoon Resort: The Lagoon Resort is located on its own small motu in the area near Samade facing the inner lagoon. It’s the only resort on that side of the island (there are small hotels) and the only resort in the Cooks with the ever popular overwater bungalow. To access the Lagoon Resort, there is a boat that runs back and forth on demand. The motu itself is very well groomed, but a little barren. It’s not nearly as lush as Etu Moana or the Pacific Resort. The rooms look sturdy but are not very authentic in appearance. The overwater bungalows are more authentic, though. I did not see the interiors of the room. Outside of the beach rooms, there were hammocks and lounge chairs. The best part of the resort, besides the incredible view, is the area toward the end of the island where the sand comes out to a point. There are more private areas to dine and lounge, a separate pool to relax in while enjoying the pool, and a beach bar. This area of the island is very much set up to be a romantic spot for couples, but there were kids staying at the resort (Etu Moana allows children 16 years of age and up.) Overall, the resort was not as warm in appearance and I’d classify it more as a 4.5 star property but with a 5+ star view. I’d recommend this property to those wanting an overwater bungalow experience but can’t afford Tahiti, those who want a full service resort at a good price, and those who really just want a killer view. Pacific Resort: The Pacific is billed as the top resort on the island. 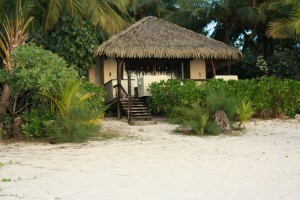 In fact, it’s where Jeff Probst stayed while Survivor was being filmed in Aitutaki! The Pacific Resort is about a 10 minute walk along the beach from Etu Moana, toward the downtown area. Most of their villas are located along the beach. It’s evident from the moment you walk up to the property that it’s well maintained and a bit more exclusive than the Lagoon Resort. 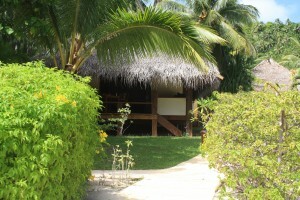 The villas are authentic in appearance, though not as much as Etu Moana. They are also somewhat well spaced to allow for more privacy. The Lagoon Resort did not seem as private, except for the OWBs, but even they were in a row next to each other. 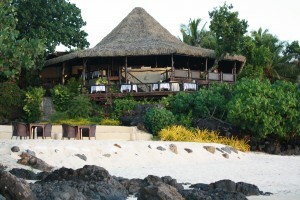 The Pacific is also very lush, with a gorgeous swimming pool, beach bar, and the gorgeous Rapae restaurant. When we arrived there, there was local entertainment set up at the bar singing for the guests. The stone work along the pathways is also quite intricate and in conjunction with the greenery and the buildings, make the Pacific feel quite warm and intimate. The Pacific is larger than Etu Moana- 3 times as large!- but has the same view and still has a smaller property feel. I would recommend the Pacific to those who want a higher end property, but want a full service resort experience (bar service, restaurants, spa) without having to walk down the beach for those amenities.